Okay, so maybe you don’t have chickens roaming free in your backyard and that wrap around skirt is the closest thing you currently have to the wrap around porch of your dreams. 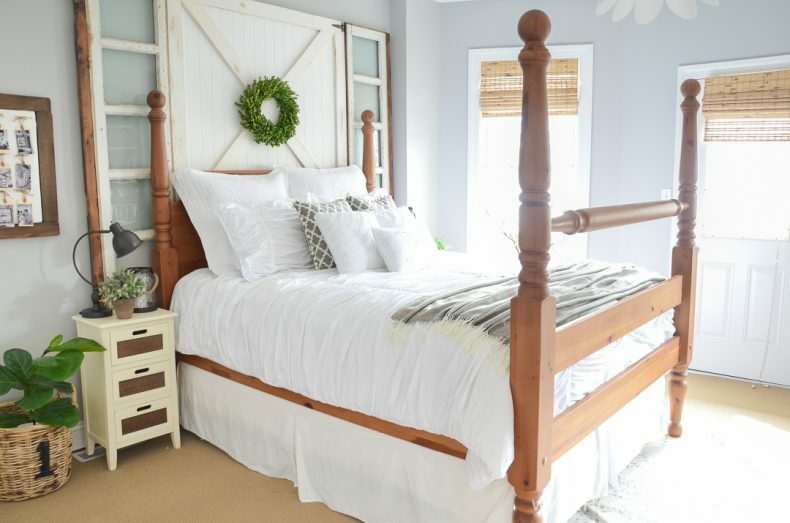 The good news is that you can still achieve a modern farmhouse look in your bedroom today—AND you can do it on a tight budget! No free-range chickens needed. 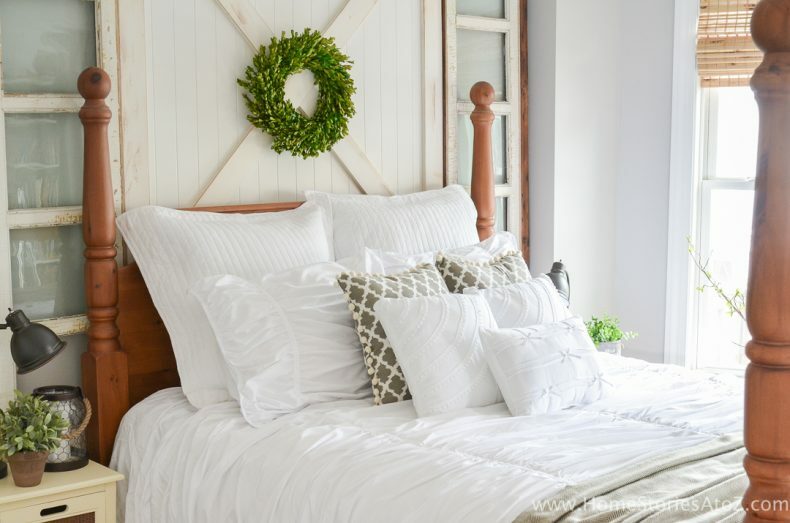 😉 Here are 5 affordable tips to creating a modern farmhouse look in the bedroom. 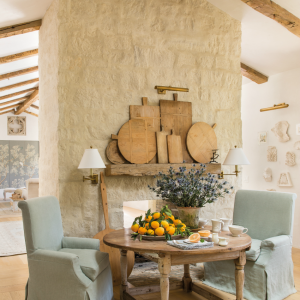 Tip 1 to Achieving a Farmhouse Look: Use a light, bright, and neutral color palette. 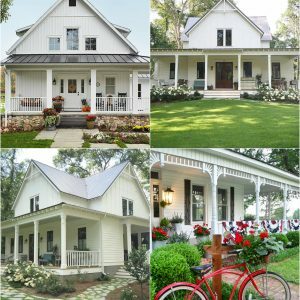 Keeping a light, bright and tight color palette will help you achieve the farmhouse look you crave. Painting walls, trim, and paneling white or light gray is an affordable way to lighten and brighten your space. 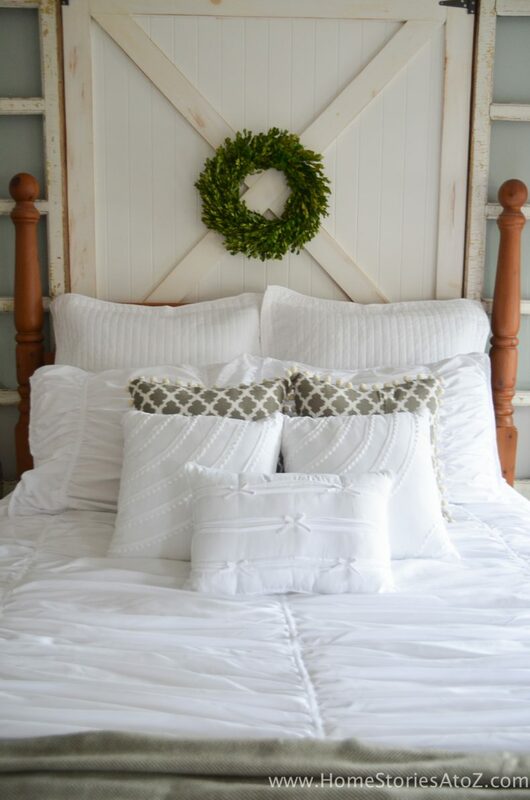 If a white shiplap, or plank wall isn’t currently in the budget, consider creating a wood headboard as a focal point. 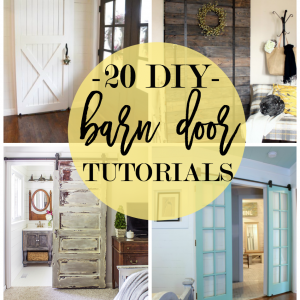 I created mine for under $100 using architectural salvage from our first home, a sheet of beadboard, and a few 1×4’s! 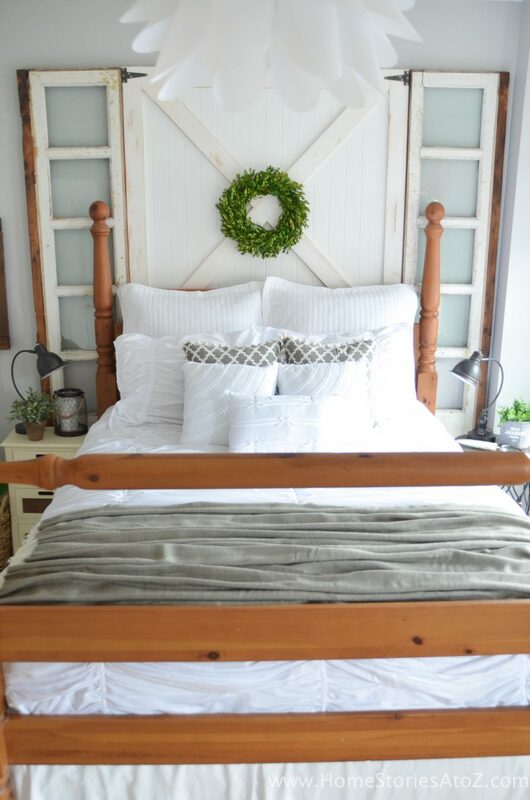 You can see the full DIY Headboard Tutorial here. The furnishings and textiles in the room should also be kept within a light, bright, and neutral color palette. 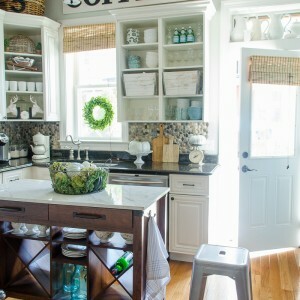 Use whites, grays, and greiges in varying textures to create interest and add depth to the room. Accent with black and a few pops of color in your accessories. 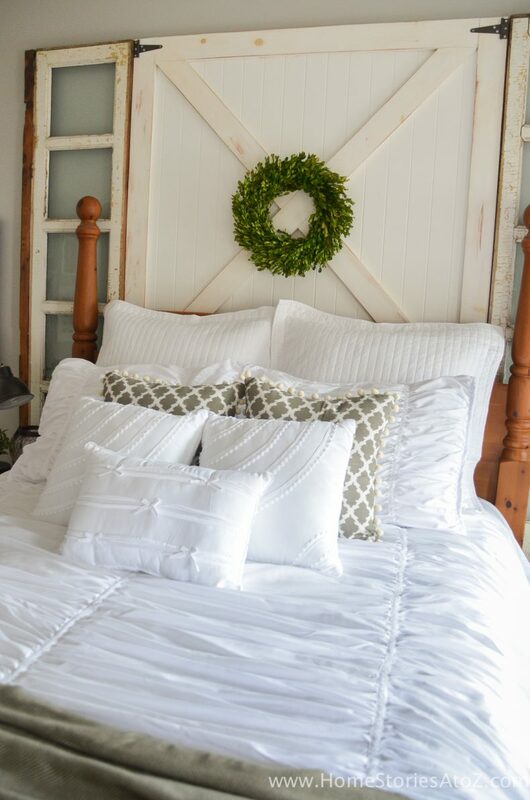 Tip 2 to Achieving a Farmhouse Look: Keep linens light and airy. 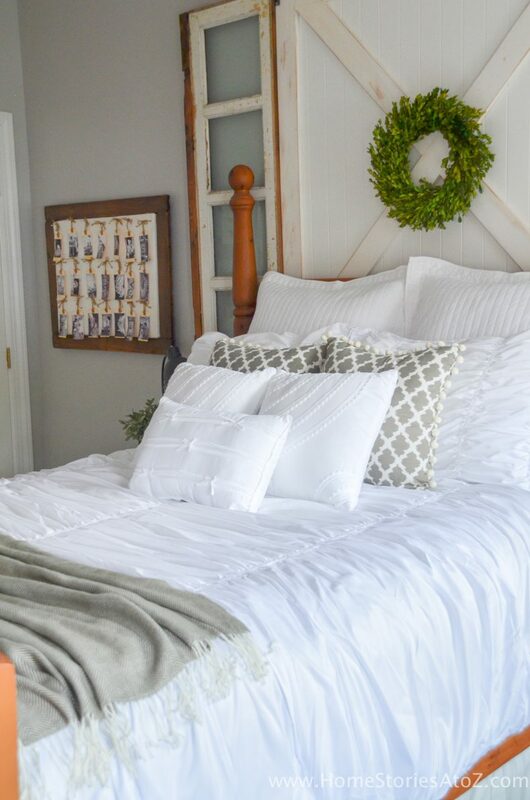 The layered bed looks lush, cozy, comfortable, and casual. 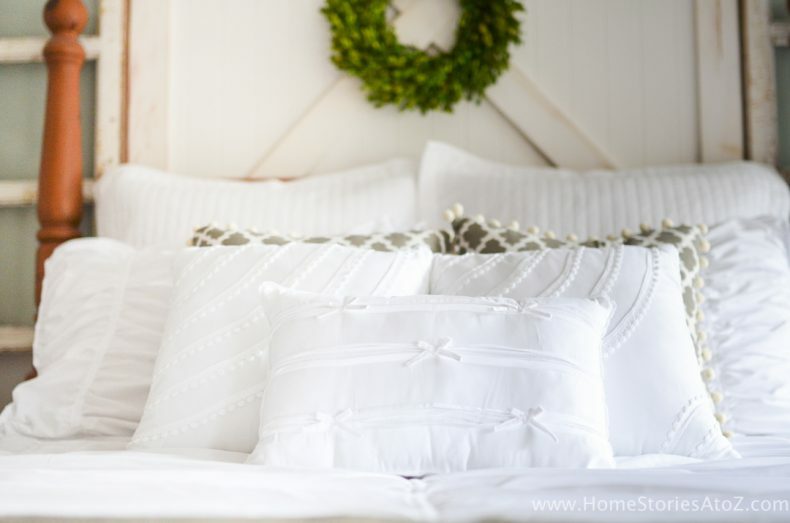 The best part is that ALL of the linens on my guestroom bed cost less than $125 at Walmart! You can see all of the link sources at the bottom of the post to learn more. 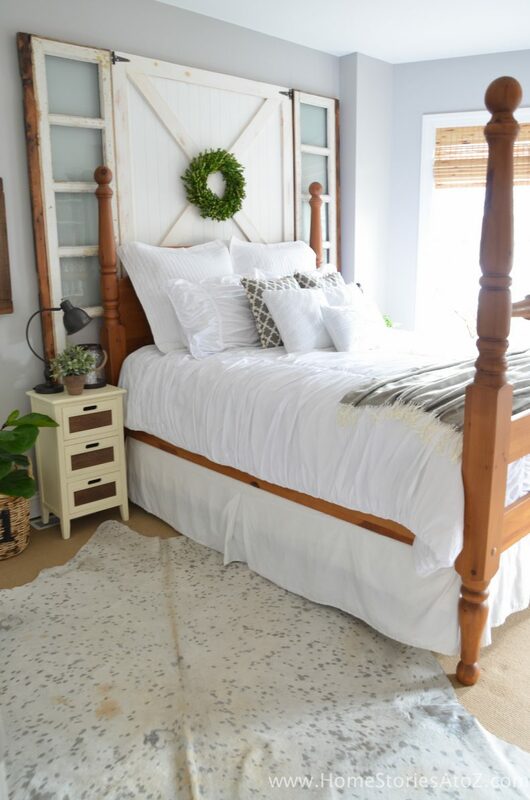 Tip 3 to Achieving a Farmhouse Look: Mix and match furniture and add time-worn pieces. 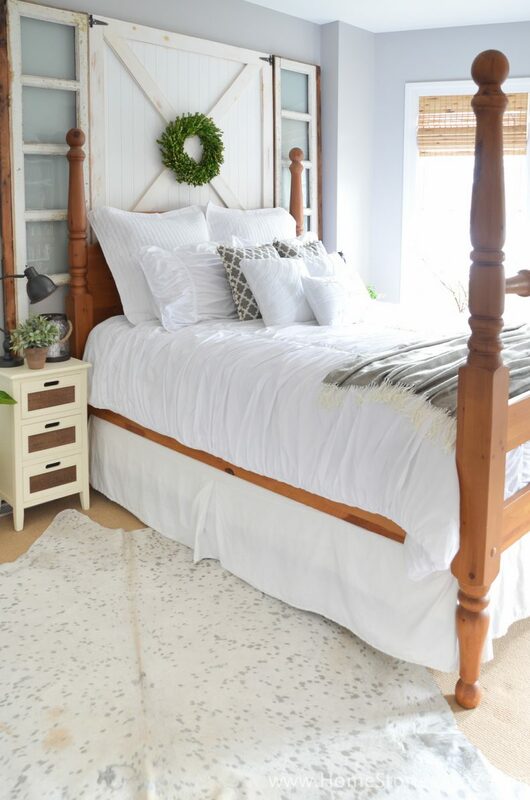 A farmhouse bedroom should look time-worn and collected. 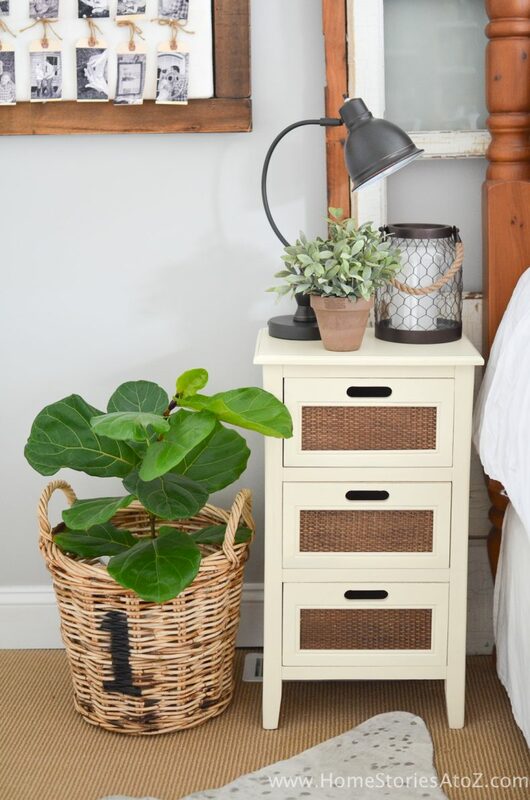 End tables and bedroom furniture do not need to match but should look cohesive. Painted furniture, furniture with baskets, and industrial-looking pieces that incorporate wood and metal are all good options to consider when creating a modern farmhouse look. I love the vintage-feel of these schoolhouse table lamps . 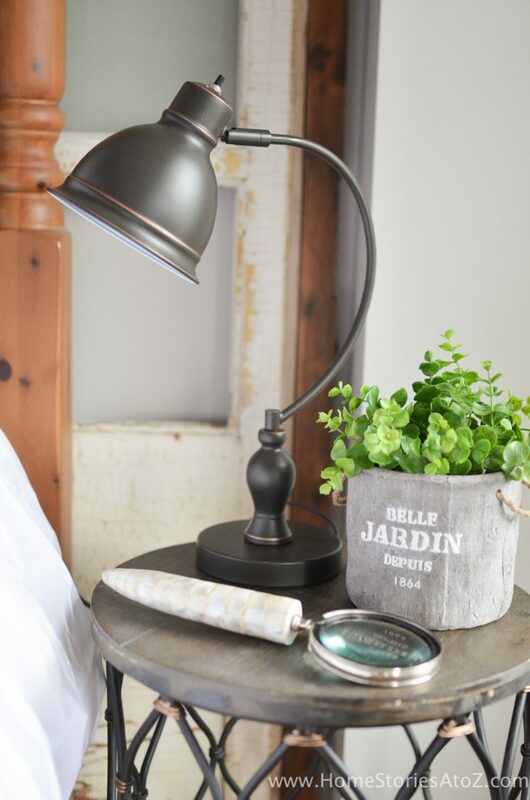 The oil-rubbed bronze finish gives an antique modern farmhouse vibe. 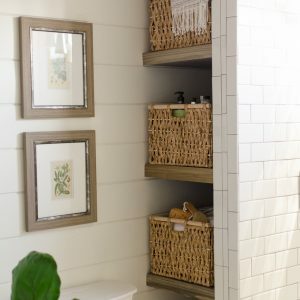 Tip 4 to Achieving a Farmhouse Look: Add baskets and touches of wood to warm up the space. To keep things from looking too stark and cold, be sure to add touches of warmth to your space. If you don’t have wood floors in your bedroom, consider adding wood picture frames, baskets, and bamboo blinds. 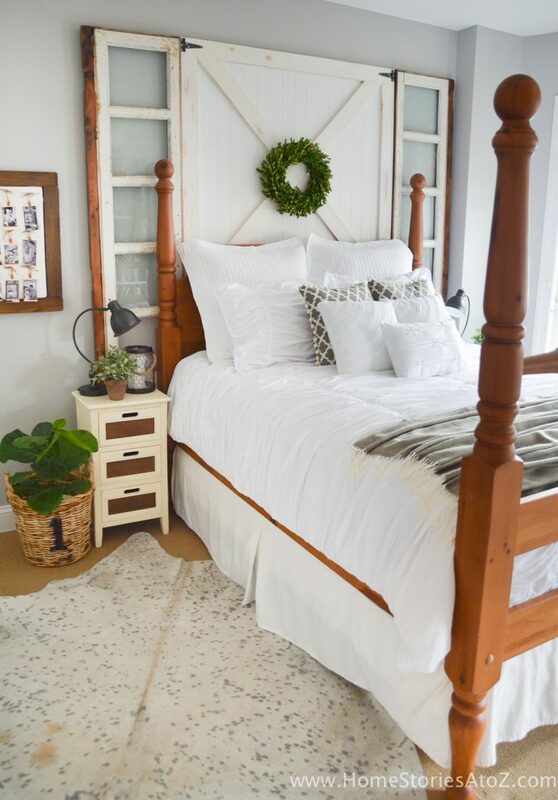 In my guest room, the four-poster bed, wood trim on the headboard, picture frame, basket-front drawers, planter-basket, and bamboo blinds all work together to warm up the space. 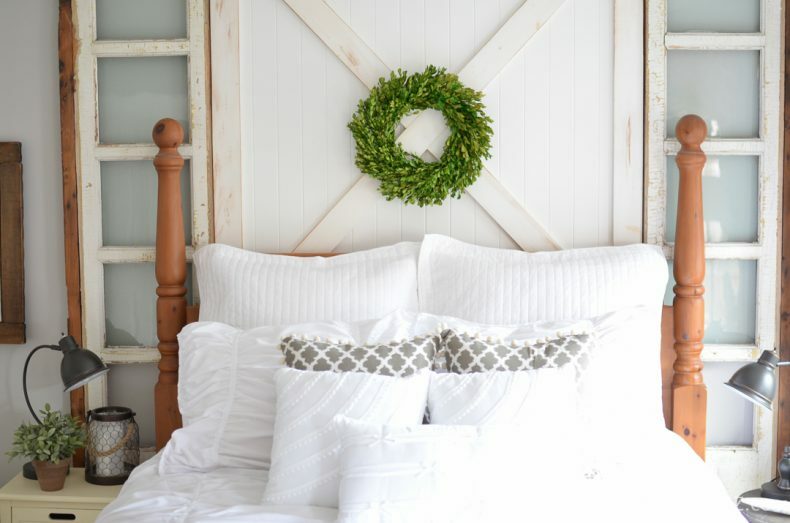 Tip 5 to Achieving a Farmhouse Look: Accessorize with greenery. Every room needs a “living element” whether it’s a vase of flowers, a wreath, or an indoor herb garden. If you have difficulty keeping plants alive, dried or faux plants are good options to consider. Good farmhouse-style plants include boxwood, herbs, magnolia leaves, lavender, dried hydrangea, boston ferns, and seeded eucalyptus. Be sure and stay connected with Better Homes and Gardens at Walmart for more product ideas and new releases! where is the night stand on the RIght from? The industrial stunner! It’s from Wayfair. Here is the link for it: http://rstyle.me/n/b5z6e6n7aw The come as a set of two nesting tables. I placed one in our family room and one in the guest bedroom. I love it all, but I especially love the tree in the basket. What kind of tree is that, I could use some more greenery in my home! Thanks! It’s a small fiddle leaf fig. I’m ordering the pillows and throw from your links! I have all white bedding from walmart also and I love it! It is white and has the little pintucks on it. 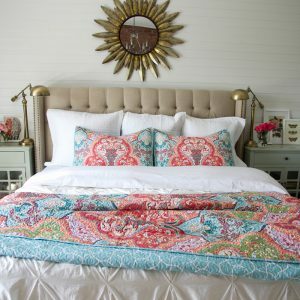 These pillows and the throw look fantastic on your bed so I can’t wait to get them in!! Aren’t they the cutest? I am impressed with the quality. I honestly wasn’t expecting all that much because they were so affordable but they are perfect. I’m kind of obsessed with the throws. The red and white one would be perfect for Christmas. Ok, but where is that bed from?? ?